Neuro-Dramatic-Play is an attachment based intervention that focuses on the early playful relationship between ‘mother and unborn child - mother and newborn child’. Through play and drama, it emphasises a combination of basic trust, security and ritual, with stimulation, exploration and risk. Ritual and risk form the basis of children feeling safe in the world.as well as a desire to explore it. Neuro-Dramatic-Play enables people to become more playful and to think ‘outside the box’. It encourages people to be more independent and self-reliant. It affirms people’s identity and self-esteem, and the building of social relationships. It is an ideal approach for working with children who have been traumatised, neglected or abused. - Theatre of Resilience: role-play and dramatisation; culture-based performance and interactive stories; celebrations and ceremonies. For training courses please look at the courses and contacts sections of this site. Neuro-Dramatic-Play of course is closely connected with ‘Embodiment-Projection-Role’ (EPR), a developmental sequencing that shows how a child is involved in a series of dramatic scenarios and activities between birth and 7 years. EPR is explained in more detail in a separate section, what is relevant here is the embodied nature of Neuro-Dramatic-Play. Right through pregnancy, an infant and its mother are dancing their way through a series of movements and role plays. NDP is unique in focussing on the playful nature of pregnancy, and linking it to the dramatised and playful attachment after the birth. NDP is embedded in the Embodiment stage once the baby is born. Although Neuro-Dramatic-Play is mainly used as an intervention with children, its basic principles can be applied at all stages of life. What is unique about NDP is its focus on the ‘dramatic response’; the ‘as if’ response of the small infant when trying to imitate the expression on the mother’s face. This usually happens with a few hours of birth. The majority of play of small infants is dramatic play with changes in expression, vocal sounds and a persistence for imitation. NDP sees dramatic play as central to human development. Neuro-Dramatic-Play acknowledges the influences from Attachment Theorists, Neuroscientists, Play Therapy in all its diversity, Play, Drama, Dramatherapy, Storymaking and StoryBuilding, Ritual, Theatre and Performance. Indeed Neuro-Dramatic-Play integrates many diverse approaches into an observable and verifiable paradigm. 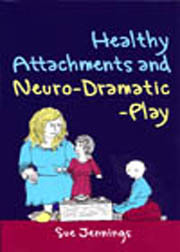 New DVD: Neuro-Dramatic-Play: Journey to Playfulness and Creativity available from Healing Tree. Embodiment - Projection - Role (EPR) is a developmental paradigm which uniquely charts the progression of dramatic play from birth to 7 years. Based on extended observations with babies and young children, and pregnant women, it provides a parallel progression alongside other developmental processes such as physical, cognitive, emotional and social . EPR is 'value free': it does not rely on a particular school of psychological theory, indeed it can be integrated into any psychological model or therapeutic or educational practice. EPR charts the 'dramatic development' of children, which is the basis of the child being able to enter the world of imagination and symbol, the world of dramatic play and drama. The early attachment between mother and infant has a strong dramatic component through playfulness and 'role-reversal'. Even in pregnancy the mother is forming a dramatic relationship with her unborn child. It creates the core of attachment between mother and infant. It gives a child the experience and skills to be part of the social world. Embodiment - Projection - Role are the markers of life changes which are ritualised through playing and drama from one stage to the next. During the E stage we can see how the child's early experiences are physicalised and are mainly expressed through bodily movement and the senses. These physical experiences are essential for the development of the 'body-self': we cannot have a body image until we have a body-self. The child needs to be able to 'live' in his or her body and to feel confident about moving in space. The change-over from the E stage to the P stage is a time of transition, which is also a marker where Winnicott (1974) describes the 'transitional object'. It can be a piece of cloth or soft toy: both texture and smell are important, therefore being linked to the child's sensory experience. It is usually considered to be the child's first symbol - usually representing the absent mother figure. The transitional object is both ritualised and creative: it has to stay the same, even though it might become grubby, and it is named; but it also changes and becomes a 'mask' to hide behind, a blanket for a doll or a scarf for a costume. During the P stage the child is responding to the world beyond the body, to things outside the body. The child's responses may well be physical, for example when a child plays with finger paint but the important point is that the paint is a substance outside the body boundaries. 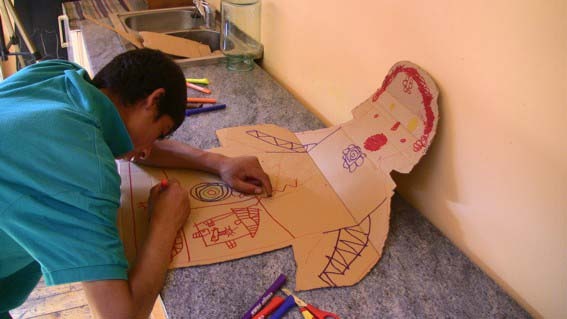 As the P stage develops children not only relate to different objects and substance, they also place them together in shapes and constellations. We see an increasing use of stories through the objects such as the dolls house or puppets. Then there is a second stage of transition as the child decreases projecting roles and stories through the puppets and begins to be the characters. The second transition may be marked with different kind of objects, maybe an object of authority - it may be a stick or a sword or a specific costume which allows the child to take control and direct the action as well as being in the action. Eventually the child starts to take on the roles, sometimes several in a scene, and we can observe the emergence of the R stage. There is a development of 'what is right' for a scene or a role - 'mummies don't do that' or 'monsters walk like this'; not only are roles acted but scenes are directed and there is an increasing awareness of design. It is as if the child has fully integrated E P and R as they create plays with movement, costumes and props and various characters. Usually the three stages of E and P and R are completed by the age of 7 years. However it does not stop there. We continue to visit these stages in pre-teen and teenage development, not always in the EPR sequence. Nevertheless they are experimented with, tried and tested as identity continues to develop. Finally we make choices as adults based on the stage that we have dominance in, and usually take up jobs and hobbies that have either an E or P or R focus. Conflict or distress can ensue if we make a life choice that is not based on our own choosing but comes from the pressure and expectations of others. Embodiment: most of our early physical and bodily experience comes through our proximity to others: usually our mothers or carers, (I shall continue to use the word mother in a generic sense of the person who cares for us). We are cradled and rocked as we co-operate with rhythmic rocking a singing. Babies respond and mothers respond again, as there is a collaborative approach to physical expression. Already the movement takes on some ritual/risk qualities:on the one hand we have ritualised rocking movement and on the other bounce up and down with glee. I learn about my own body by being bodily engaged with another, thus I am 'mimetically engaged' (see Wilshire 1983 chapters 3 and 4). The body is the primary means of learning (Jennings 1990) and all other learning is secondary to that first learned through the body. Therefore children with bodily trauma need extended physical play in order to re-build a healthy and confident body. being violated through physical or sexual abuse; the child's bodily boundaries are invaded with resultant trauma and confusion; there is often fear and anxiety and either an avoidance of physical contact or inappropriate physical rage or unboundaried touch. Many therapists find it difficult to consider using Embodiment in their work because of traumatic experiences in the child's or therapists past, or with the ever-present fear of misunderstood touch and possible litigation. There are several solutions: either to work in groups and do group movement which is very good for social development - working in pairs then threes and so on or to explain clearly and in detail to the child and the parents that touch is involved, with a description of what touch and why, and have it built into the contract. Parents will usually understand that appropriate touch is important for the healing of the child and indeed, perhaps it is possible to have Embodiment workshops for the whole family. Having said that, not all movement has to involve touch and there are many healing movement games for the child and therapist to do together. You may also work with various 'props' such as hoops, string, or silk scarves; the scarf establishes a contact with the child through the scarf - this is especially useful when working with autistic children. It is important for the therapist and play worker to feel comfortable with movement and dance and to have additional training in these areas. Around 12-14 months we can observe the time of transition from the body to the world 'out there' - the world of projection and objects that are separate from my own body. As Winnicott (op.cit.) has suggested, the first attachment to an object - often soft and cuddly such as a blanket or shawl - marks the transition to other objects, just as the attachment to the primary carer will lead to healthy attachments to other people. However the object itself, as stated above, it not just a ritual symbol, representing the absent mother, it is also a creative object that can turn into many things and be played with. It almost always has a name and it has to stay the same (woe-betide whoever puts the transitional object (TO) in the washing machine), but it also becomes personified and is talked to, it can be a hiding place or a mask. The TO is a prime example of flexibility, and of ritual and risk. As children develop more and more into the P stage we notice they move from exploratory play where things are tasted and tested to more patterned and organised play with objects, to more dramatised play with stories. Although it has these variations it is still projected play - i.e. it is play beyond the body and objects take on roles and meanings rather than the child. Without confusing the issue, we could even say that the P stage has EPR stages within it as described below. However it is clear on closer examination that all the activities are projective ones. Children can be encouraged to create in different media, and therapists can create at the same time so the child does not feel scrutinised. 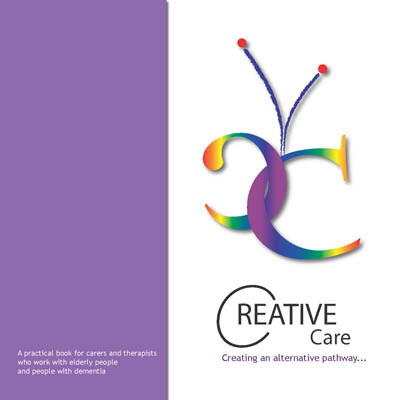 The child and therapist can co-create an artistic construction thus building a shared endeavour. Creating with the child is not the same as either imposing on the child or directing the child. We can observe towards the end of the P stage that a child's play is becoming more and more 'dramatised' with stories and scenes being enacted from newly created stories or stories that already exist. A child is developing their own narrative structure, stories which have a beginning, a middle and an end, but also they are increasing their capacity for 'free-play', what adults would term improvisation, where you start with a topic or an object and see where it goes. We could also refer to it as 'stream of consciousness', which may well feed into a later narrative structure, but is a quality and skill that is invaluable as a life skill. During this transition we can observe children become their own directors and the directors of others as they organise 'events' and create plays in which they both perform and direct. They often acquire symbols of authority such as sticks, swords, magic batons or special uniforms or costumes. The are able to exist separately with their creativity as well as being part of pair or small group. It is important that the child has the opportunity to play 'distanced' roles i.e. those that are in stories and plays because the paradox is that the child is likely to come nearer to their own experience, than if they enact their specific, immediate situation. This is the paradox of drama: that I come closer by being more distanced, (Jennings 1998). This also is the hardest thing for therapists to handle because all we want to know what is going on. We have invented interpretation in order to explain things and probably reduce our own anxiety. At another level we 'know' what is going on and certainly the child knows. Maybe we have to learn to bear 'not knowing'; to stay with the chaos and allow the meaning to emerge. 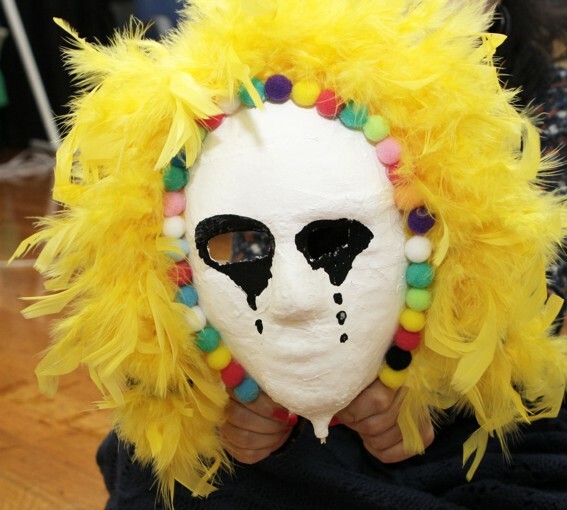 'situation where role playing becomes more complex and includes dressing up, developing dialogue and creating environments within which to play different roles. Scenes and stories are enacted with peers being included although there may be some situations of a child playing in a dramatic way on their own'. EPR can be integrated into all approaches of psychology and play therapy although it works more efficiently where therapist and child can co-create the scenes and activities together. The early roots of EPR can be traced to pre-birth experience in the dramatised relationship between mother and unborn child (Jennings 1998, 1999), so we can say that the infant is born already 'dramatised'. It is important that therapists using EPR both re-experience these stages for themselves as well as making observations of children in these stages. This research is still being developed and play therapists are encouraged to test it in their own research. Footnote: Assessment through EPR is written up in Jennings 1998 and 1999; you also need to be aware of Courtney's Developmental check-list in Jennings 1998. Above all, the approach to play and playtherapy through Embodiment - Projection - Role, focusses on the playful attachments that develop through playing. This is both essential to the child's healthy maturation as well as forming a basis for future relationships. Astell-Burt C 2001"I am the Story: The Art of Puppetry in Education and Therapy London Souvenir Press"
Jennings S 2001 Embodiment-Projection-Role, video with Gordon Wiseman Bleaden Actionwork. Jennings S 2002 ‘Play, Drama and the Brain’ presented at International Symposium Arts and the Brain, Oslo.